A mix of glass and acrylic in a variety of shapes ranging for rounds to hearts to squares to ovals. Each bead was chosen to complement the next. Each bead is paired with silver ball spacers and many are paired with flower detailed bead caps. 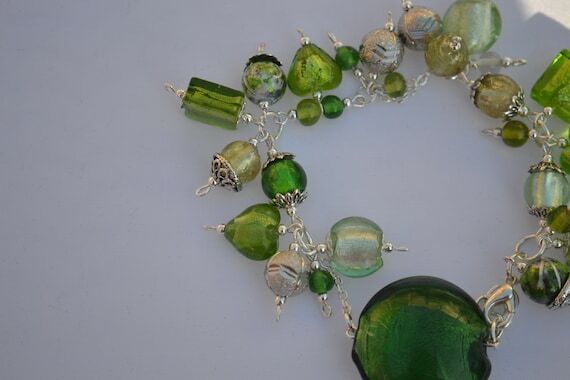 A large Green silver foil puffy coin bead is the focal of this bracelet. The bracelet measures 7 1/2 to 8 inches. Where available all items are sent in an organza bag inside a pillow gift box. I am currently giving a 10% donation of all my sales to Balls to Cancer.